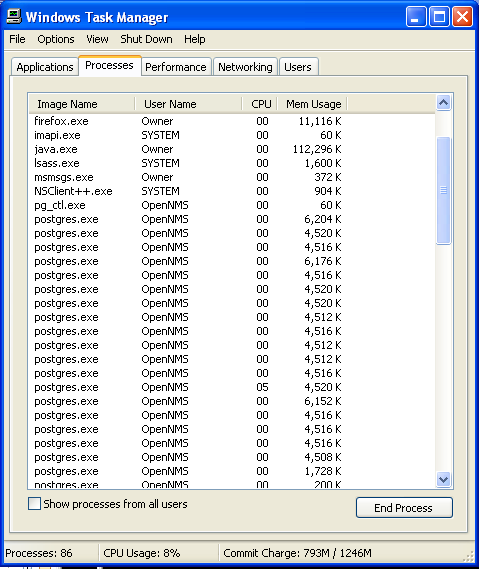 Task Manager is built into Windows to view and manage running application programs and processes. You can use Task Manager to end programs and monitor performance. Always on Top: Task Manager is always on top of the stack so no other windows can cover it, when it is open. Minimize On Use: Minimizes Task Manager, but leaves the taskbar button visible, when you switch to another program. Hide When Minimized: Minimizes Task Manager and also hides the taskbar button. When Task Manager is open, you will see a small green square in the Notification area. Double click it to make it visible again. One of the most useful aspects of Task Manager is to end frozen or hung programs. If your program is hung, you can press cntl, alt, delete, simultaneously to open Task Manager. Click the Applications tab. The program that is hung will read Not Responding. Click the program name and then click the End Task button. If the system is hung and you need to need to save your work, you can click the Switch To button to get to the program and save before exiting. If you need to run a diagnostic program or go into DOS in command line mode, you can click on the New Task button. The Create New Task dialog box pops up. Type in the program startup command or type cmd to go into DOS and click OK. The Windows menu lists options for arranging your open windows. If the screen is frozen and you need to bring a program to the front, for instance, you can rearrange your open windows here. Resource Usage. The faster your CPU and the more memory available in your system, the better. When all of your memory is used, the system has to access the hard disk to make room. This slows the system down. Processes: Total number of processes running on the system. CPU Usage: Percentage of the CPU currently being used. Commit Charge: Total commit charge/total available memory. Total commit charge is the total amount of memory being used by the running processes. Total available memory is the total physical and virtual memory available. Commit charge/total available memory shows the total available memory being used of the running processes. Physical memory is the actual amount of RAM in the system. Virtual memory is the part of the hard disk called the paging file where data is stored when RAM gets full. A page fault occurs when the system has to go to the hard disk to fetch from virtual memory. Information is swapped back and forth between physical and virtual memory. This is called paging. Image Name: The Process name. User Name: The user account that is running the process. CPU: The CPU percentage being used by the process. Mem Usage: The amount of memory needed by the process. Memory is usually the main reason a computer runs slowly. If your system is constantly having to use virtual memory, the slower everything runs. 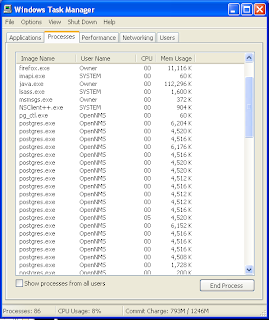 If you click on the Mem Usage column, you can see what processes are using the most memory. An often ignored thing you can do to is close open programs not being used, as well as getting rid of a lot of the icons on your desktop. All of these things use resources. NOTE: Be careful about closing a running process. If you are not sure what it is, do not close it. Click the View column and Select columns to view additional columns relating to the process running. Base Priority: The priority assigned to the process. CPU Time: Total number of seconds of CPU time the process has used since starting. CPU Usage: The amount of processor time the process has used since first started. GDI Objects: The number of Graphics Display Objects used by the process. Handle Count: The number of objects to which the process currently has handles. I/O Other: Non-disk input/output calls made by the object since it started. I/O Other Bytes: Number of bytes transferred to devices since the process started. I/O Reads: Number of file, network, and device Read input/output operations since the process started. I/O Read Bytes: Number of bytes transferred by Read file, network, and device input/output operations. I/O Writes: Number of file, network, and device Write input/output operations since the process started. I/O Write Bytes: Number of bytes transferred by the Write file, network, and device Write input/output operations since the process started. Memory Usage: Amount of memory blocks used by the process. Memory Usage Delta: Change in memory usage since the last Task Manager update. Page Faults: Number of times the process has read data from virtual memory since starting. Page Faults Delta: Change in the number of page faults since the last Task Manager update. Paged Pool: Amount of system-allocated virtual memory that has been committed to the process. Peak Memory Usage: Largest amount of physical memory used by the process since it started. PID (Process Identifier): Number assigned to the process at startup. Session ID: Terminal Session ID that owns the process. Thread Count: Number of threads running in a process. User Name: User that started the process. Virtual Memory Size: Amount of virtual memory currently committed to the process. Click Show processes from all users and you will see the actual number of processes running on your system. If you have a slow system, you can use this to see if anyone else is logged on. When a user forgets to log off of the system, that can be a big reason as to why your system might run slow. Monitoring Performance. The Performance tab shows summaries of the CPU and memory resource usage, graphically and numerically. These charts are good for identifying major bottlenecks in the system. If the CPU Usage and the Page File Usage History charts consistently run high, this means your CPU is running hard. Not good, as this means you either need to install a faster CPU or a new motherboard. However, the most common performance bottleneck is low memory. This causes the system to access lots of virtual memory. Installing additional memory will usually help the situation. Networking. Displays the network traffic and amount of bandwidth used in your Network account. Users. The people currently logged on. You will only see yourself unless you click Show processors from all users on the Processes tab. If you want to send another user a message, click on the user name and the Send Message button. This can be useful if your system is slow because someone forgot to log off. Or, you could just click the user's name and click Log Off.